1. New Shape MINI / CLUBMAN / COUNTRYMAN Monsoon Heavy Duty Car Cover for Outdoor use. Available off the shelf but based on our bespoke pattern, in two tone Black & Grey . This is a unique fabric that has been designed to protect vehicles in all weather. For complete protection the cover is lap-seamed to ensure that it remains watertight and breathable. 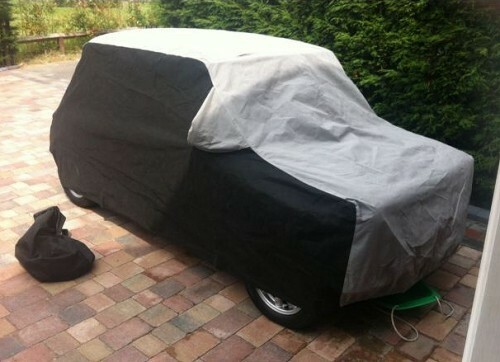 This Classic Mini Cielo car cover will keep your pride and joy free from the natural damage caused by acid rain, bird droppings, dampness and direct UV light. Individually hand tailored. UK Made.